Our mission is to shine a light on this very dark and barbaric trade. To expose the atrocities that are happening there to the world in order to enact change and force the government to pass a law that completely prohibits trade. There is only blood, death and destruction here. The darkness, it covers you. I got access to 2 slaughterhouses. In each 20-30 dogs are killed per day. 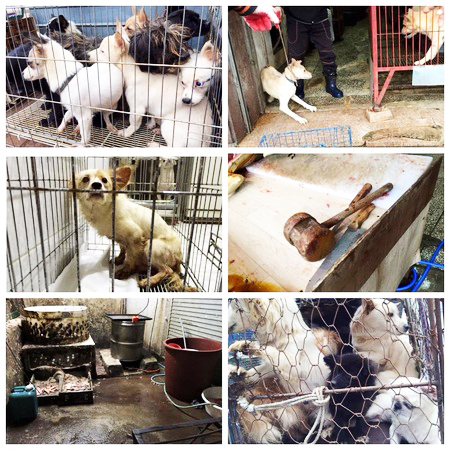 I watched one dog after another being cruelly beaten to death. Imagine that you were one of them. Would spend all of your short life in a cage. No water, no food, no medical care. Imagine having to watch each day how your brothers and sisters are brutally killed before in front of you. Until the day you are next – this is torture. It’s their screams that break you. Their eyes that never leave you again. They will haunt me forever. I left them all to their fate. Everything I could do for them – nothing. 2016 Förderverein Animal Hope & Wellness e.V.